We are well and truly entrenched in the late game now. Every war is an existential crisis for all but the largest nations. 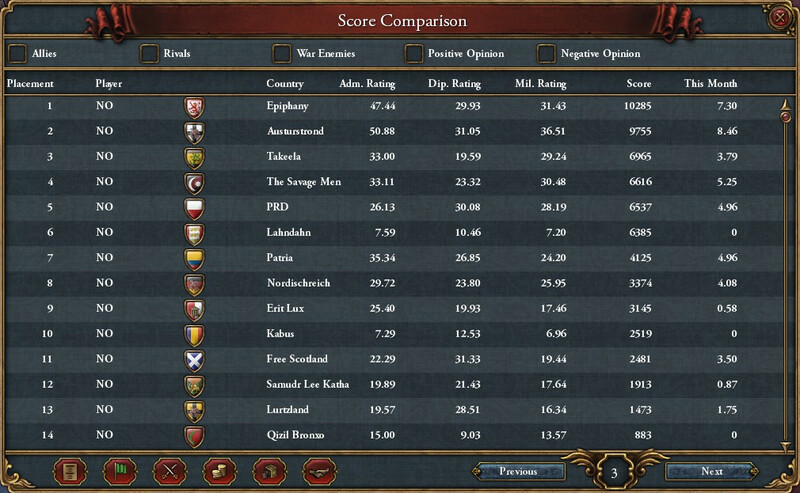 With only 71 years left in the game, it seems like the race for score supremacy is down to just two countries, while everyone else faces a fight just to survive. Again, this update encompasses 50 years of gameplay (1700-1750) instead of 25, just for the sake of my own interest and free time (Stellaris 2.0 is coming out this week after all). ~850 months remaining of the campaign. At the current rate, Epiphany would end up with their current 10285 plus 6205 accumulated score for a total of 16490. Austurstrond would have 9755 plus 7191 for an extremely close total of 16946. As I have stated many times, and will repeat forever: I have no idea how score actually works. I don't think anyone really does. Having said this, I'm going to break down this race slightly further. 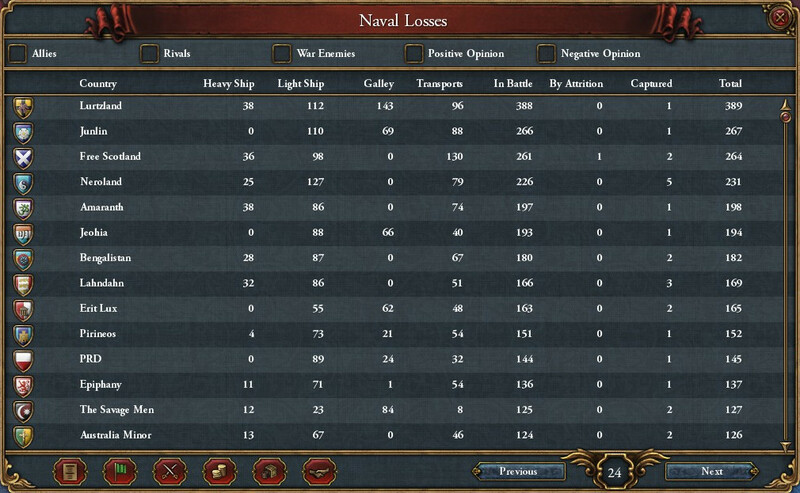 A lot of Austurstrond's massive score gain is due to their participation in the now finished PRD-Lahndahn war. If they didn't have that (ie, once that bonus expires) they would be 2nd in Adm, 6th in Dip, 3rd in Mil, and in each category they would be behind Epiphany. Therefore, if everything was to stay the same, Epiphany would pull ahead again. However, due to the ever-shifting diplomatic situation in Europe, things won't stay the same, and possibly in a way that'll hugely benefit Austurstrond, as we'll see later. We have something new to replace Institution Chat and that's Revolution Watch. The Age of Revolutions isn't just a name. With the dawn of the Enlightenment and a growing international consciousness, various subjugated and exploited peoples will be clamouring for representation, which is to some extent what happened in reality (ie French Revolution, etc). 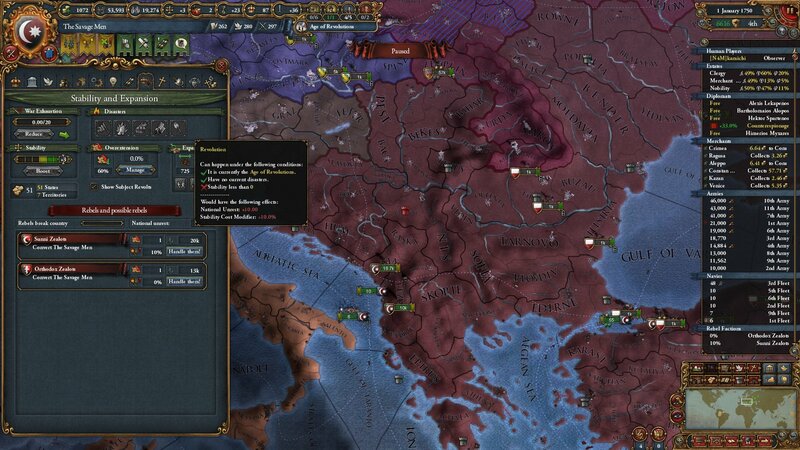 EU4 simulates this with not just one, but two disasters: Revolution and Aspiration for Liberty. 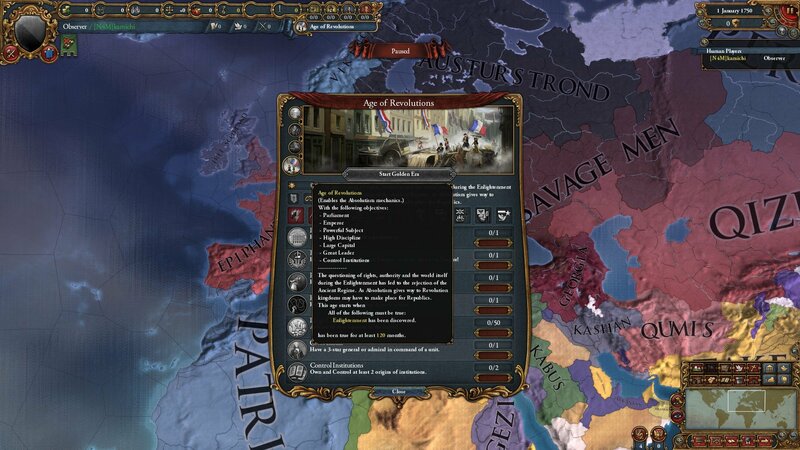 In a normal, historical campaign, France get a unique French Revolution disaster, because EU4 is a historically accurate game. Let's take Aspiration for Liberty first, because it's the most relevant, if less exciting disaster. Once a country has embraced the Enlightenment, and finds itself unstable (Stability < 1), then as long as they don't already have a Parliament, Aspiration for Liberty will activate. 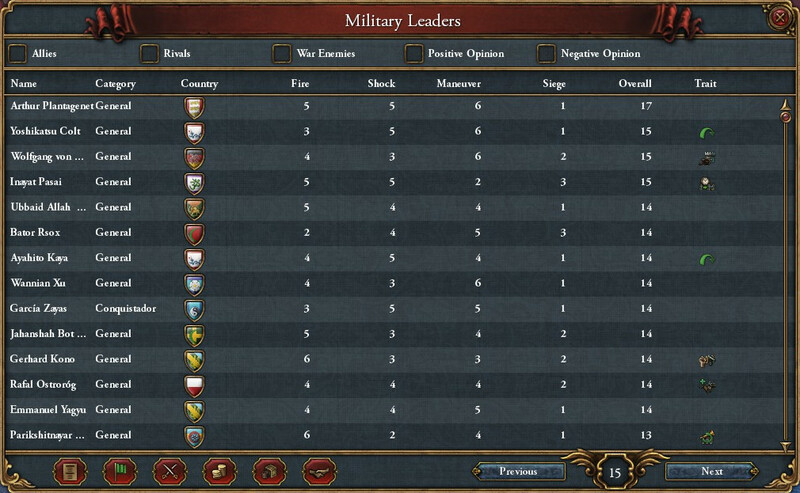 The counter ticks upwards faster the more Absolutism a country has. Once it hits 100, Revolutionary Rebels (hi) spawn en masse throughout the country. At this point, there are perhaps three ways to escape the disaster: 1. 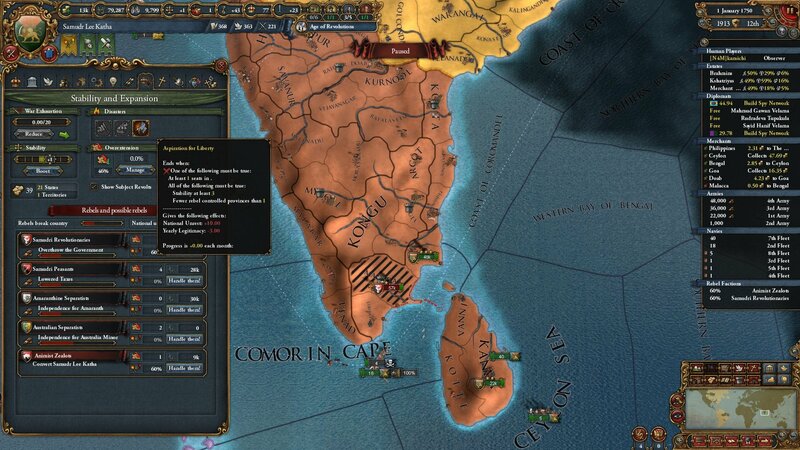 Kill all the rebels, recapture any lost provinces and hit 3 stability. 2. Be broken by the rebels, who will institute a Constitutional Republic. 3. I think you can voluntarily change to a Constitutional Monarchy or Republic but that might not be true. 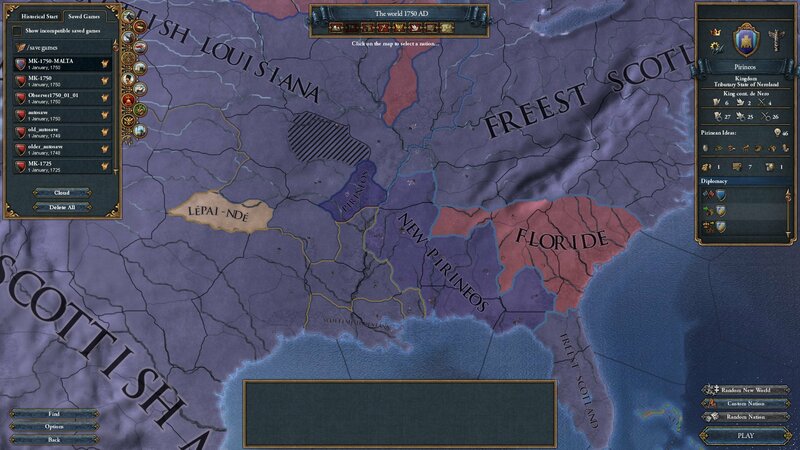 If you were watching along last session and wondering why the Golden Scourge weren't scourging as much as they used to, it's because Takeela underwent the first successful republican revolt and are now an honest-to-god Constitutional Republic. It was a lengthy civil war which wiped out their Absolutism, meaning they're not as much of a threat as they used to be (though they'll still murder all their neighbours in a straight up fight). Samudr Lee Katha and Jeohia (ie, Takeela's closest neighbour and current war target, hmm) are undergoing their own revolutions currently. 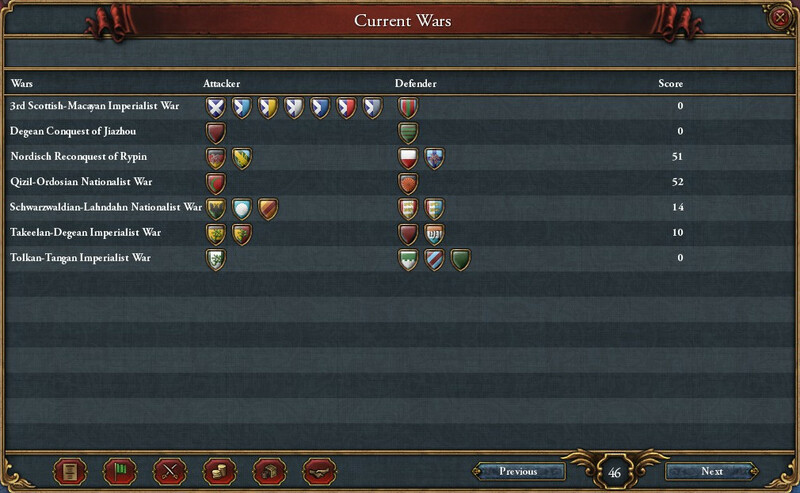 Samudr's capital has fallen and the government will be overthrown in 20 months unless their armies can retake it before then (very possible, it's a lvl1 fort and their armies are right there). No other countries are either suffering the disaster or are in a position for it to start. A whole lot of countries are sitting on +1 stability, meaning that a single stab-hit would start the disaster ticking. 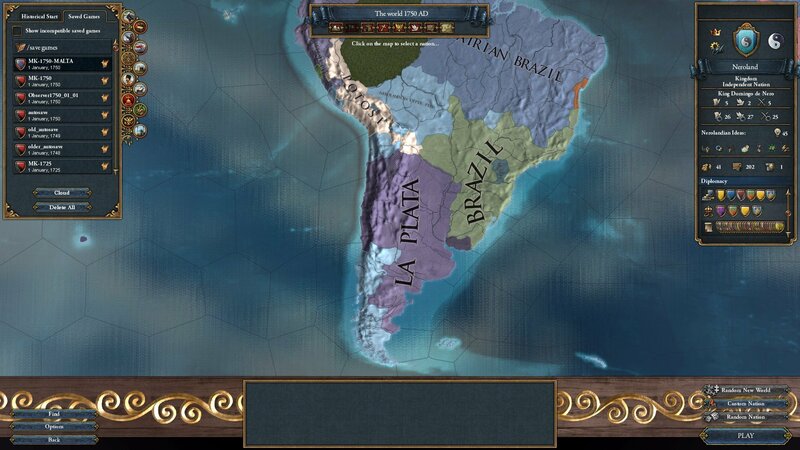 e: La Plata are undergoing it too. I don't care either, but I'm a historian and such things need to be recorded. At first glance, the Revolution disaster looks exactly the same as Aspiration for Liberty, but its results are far more interesting. Unfortunately, the starting conditions for the disaster are similar to AfL, but far more stringent, meaning that most countries would trigger AfL first instead of Revolution. Amaranth's denouement continues as Demak close in for the kill. With rivals in Bengalistan and NPO, and no real prospect of help from allied Junlin, it's simply a matter of time before Amaranth are no more. 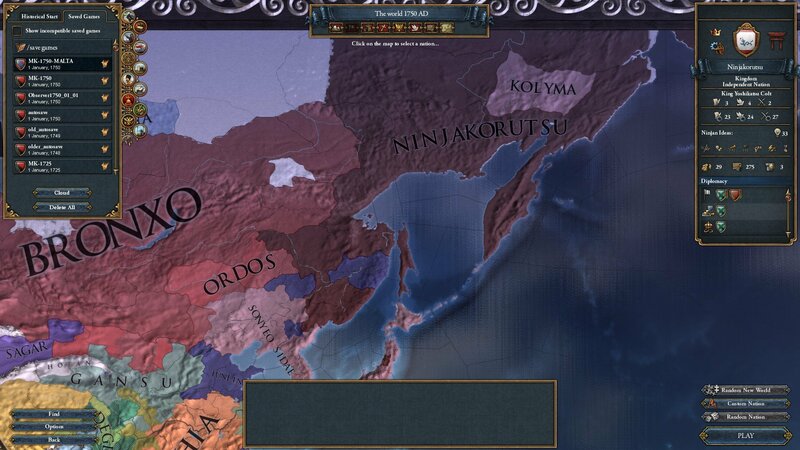 Demak have high absolutism and can use the Nationalism casus belli (half cost of same culture provinces in peace deals) to chop Amaranth down to barely anything left. For Arkansas, it's like the past 300 years just haven't happened. 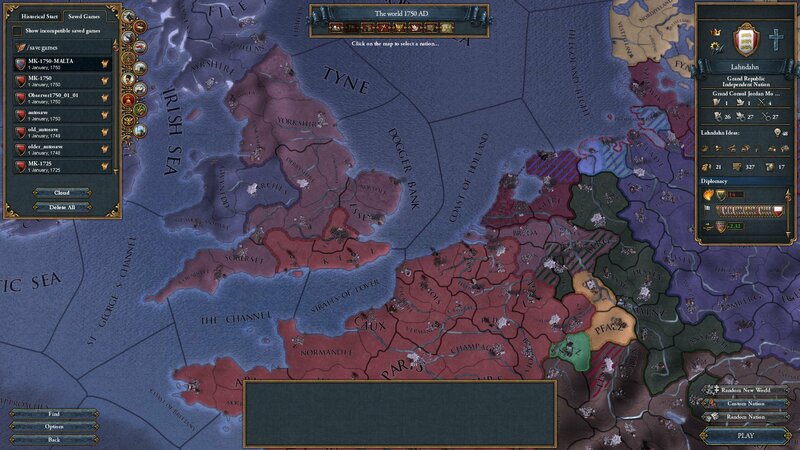 Worse, actually, at least they had control of a trade node in 1444. 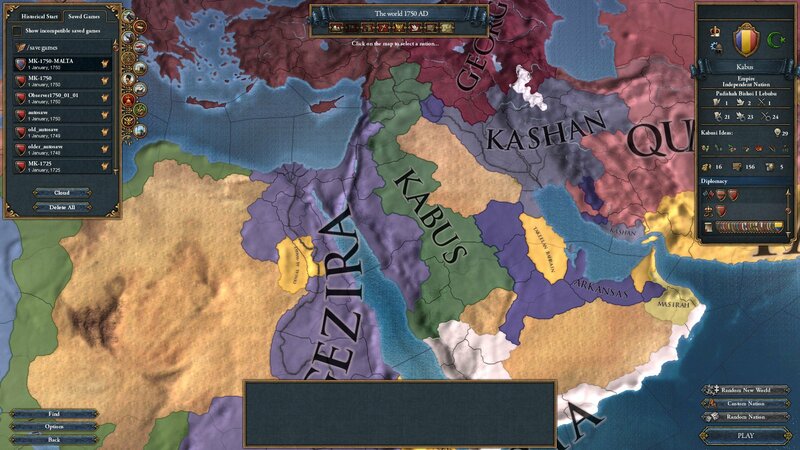 Working together, Kashan and Qumis have taken every last worthwhile province, leaving Arkansas with underdeveloped Arabian desert, two Persian mountains and a single stretch of drylands near the source of the Euphrates. The one way back to prominence for Arkansas lies in Takeela smashing the hell out of Qumis and Kashan, but in all honesty, Takeela are just as likely to finish off Arkansas first. 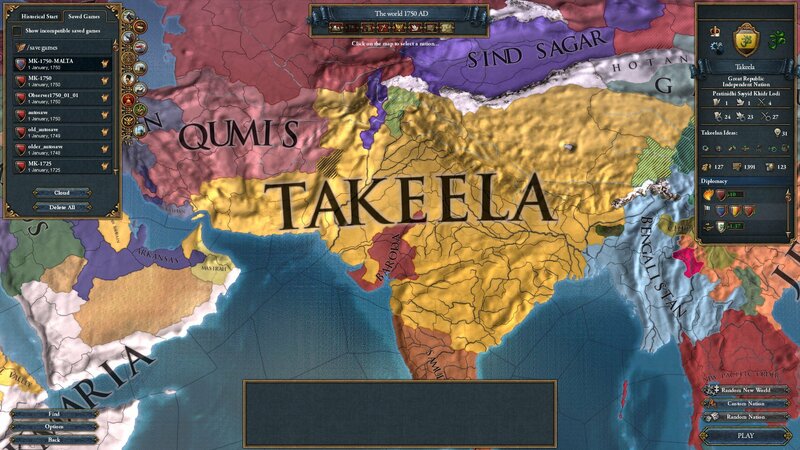 Takeela have always wanted everything, and they're not about to stop now. 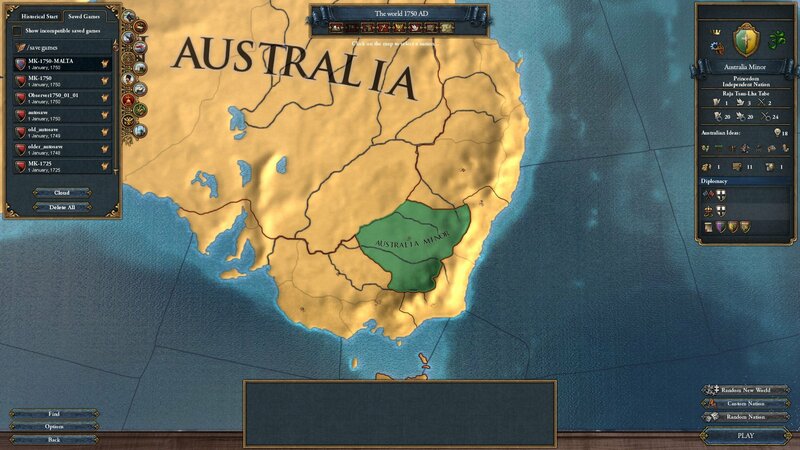 Speaking of Takeela wanting everything, here's Australia Minor's sole remaining province. It's not a good look. 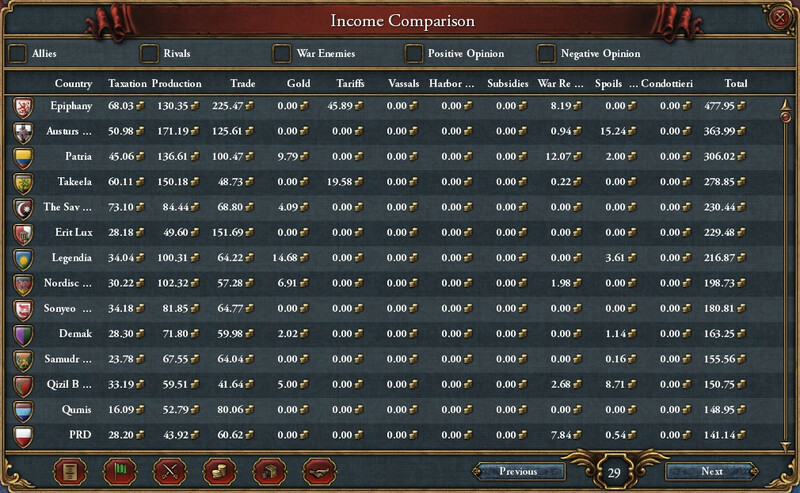 A gain of 211 development with no (real) wars of expansion is frightening. 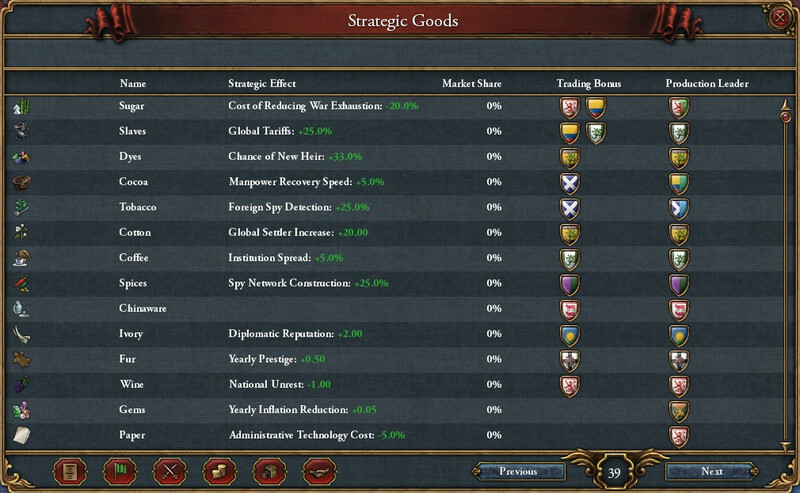 On the one hand, I really enjoy seeing the success of a country with no military National ideas, instead leveraging its Innovative and Humanist ideas into development and the highest income in the world, without owning a major trade node (though they have now been overtaking in total income by Epiphany). On the other hand, it's perfidious Austurstrond, who may well have just pulled off a potentially game winning backstab. When Nordischreich declared war on the PRD, the learned, tolerant scholars of Austurstrond decided to let their lifelong friends in the world's oldest, most enlightened demoracy die, in favour of backing the German nationalists. As discussed earlier, if current score gains remain the same, then Austurstrond can come close to victory, but will probably need more war. Their problem was that they had no realistic avenues of expansion while Epiphany had many. Now they have one, straight into the back of their oldest friend. 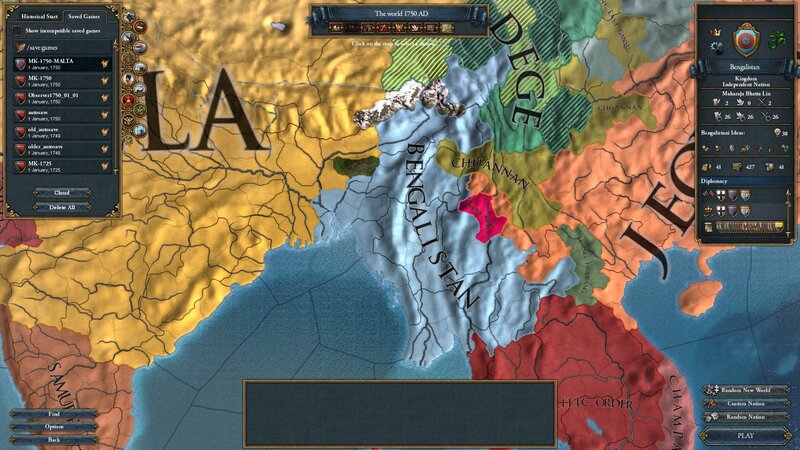 The eastward migration of Bengalistan continues. 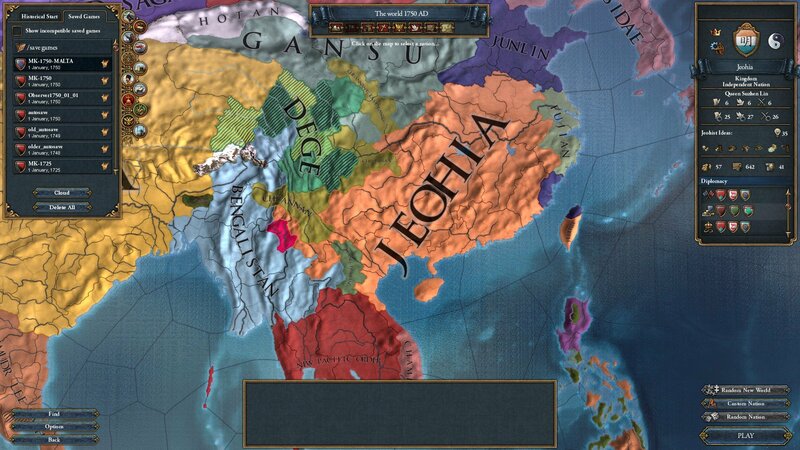 Alliances with Jeohia and Demak won't necessarily be enough to stop Takeela, but it probably means that they'll at least survive until 1821 and the end of this campaign, which is a better outcome than predicted over the past few sessions. Having secured an alliance with Tolkmaria, again, at least Denial Valley aren't completely on death row. I'm finding it difficult to see how they can spring back from this position, but lest we all forget, they've come back from worse before. London Bridge is falling down, along with the rest of it. Lahndahn were finally isolated and, of course, it was the ultimate opportunists in Epiphany who took full advantage. 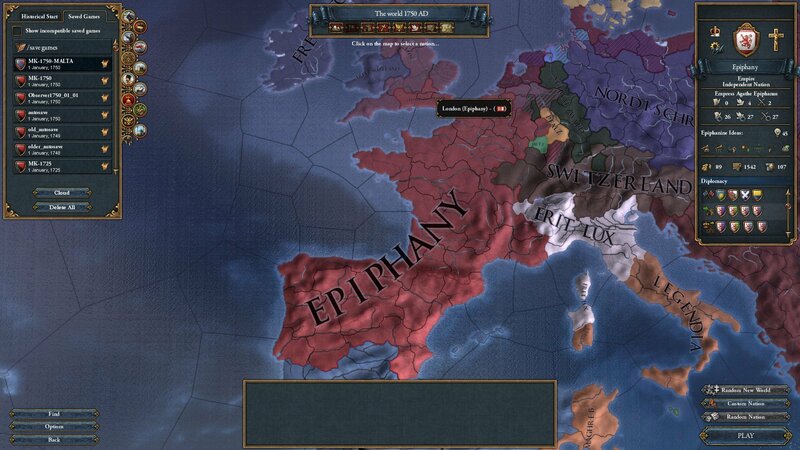 We expected Epiphany to come for the Low Countries eventually, but it's a testament to their sky high Absolutism that Epiphany managed to take every single trade province available, including London itself. They are now the largest collectors in both Genoa and the English Channel. They maintain their massive list of powerful allies. Their colonies are untouchable. Far from becoming the dominant force they could have been, Erit Lux are regressing, having lost Welsch-Brixen to Switzerland. 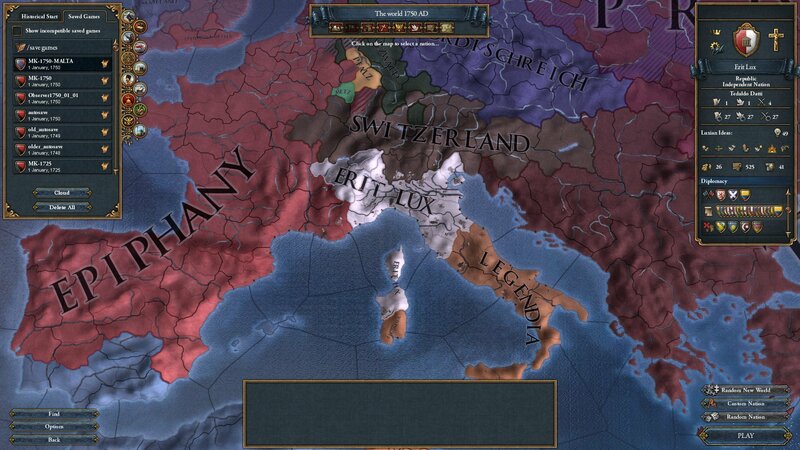 The prospect of slightly neater borders will have to console Luxians who are upset at having been overtaken by Switzerland in development too. 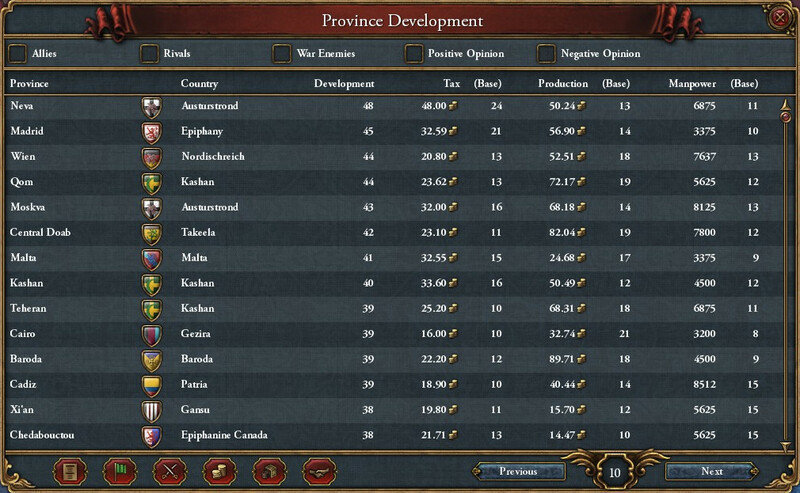 I think the most frustrating thing about Erit Lux to me, is that they've spent a whole lot on developing their provinces, but their capital, Lucca, is still only 14 development. It's a Capital City which produces Cloth, they have Economic ideas, the Economic-Quantity policy, it's fully Prosperous, it's the Birthplace of the Renaissance and they have 2000 monarch points to use. This is literally a situation I would spend a whole campaign setting up for. They could literally make their capital the city of the world's desire in a day. Rome wasn't built in a day, but Lucca could be. I loaded up the savegame and took control of Erit Lux just so I could play about with it. Free Scotland are just about managing to quell colonial rebellions in Mexico while still expanding, this time into Colombia and Peru. Out of our custom nations, they're 21st out of 30 in total development, yet they've clung on as a Great Power through solid colonial play. 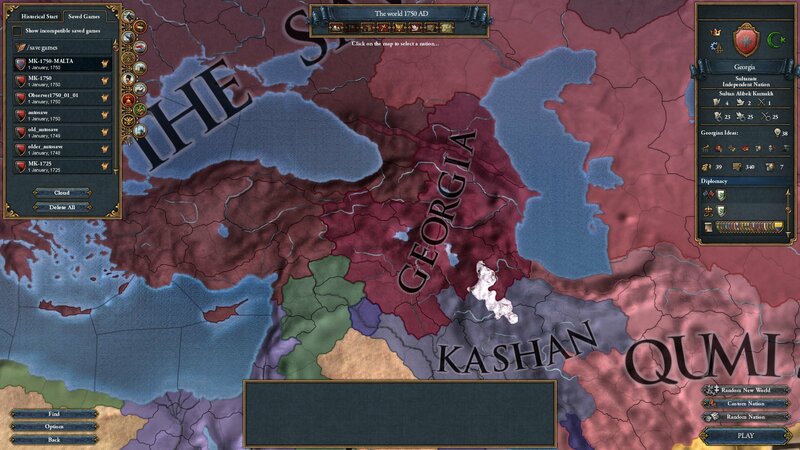 Georgia have eked out a good little position for themselves. 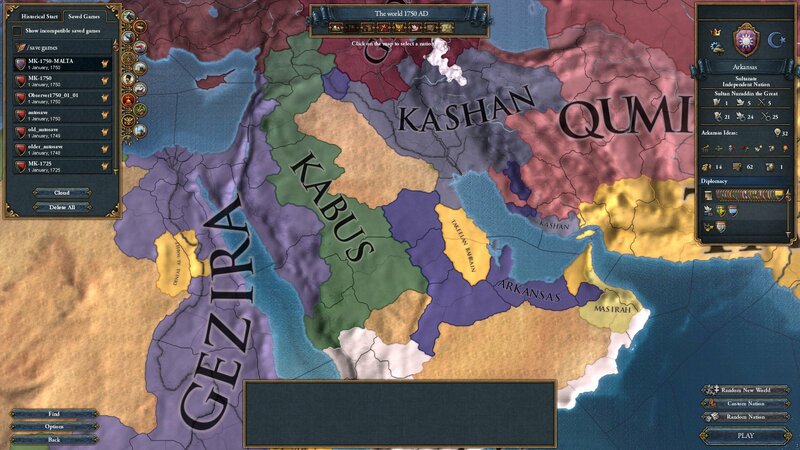 Having taken the coastline, The Savage Men have no further interest, meaning Georgia's main threats are the stretched Qizil Bronxo and the deathly-afraid-of-Takeela Kashan/Qumis alliance. 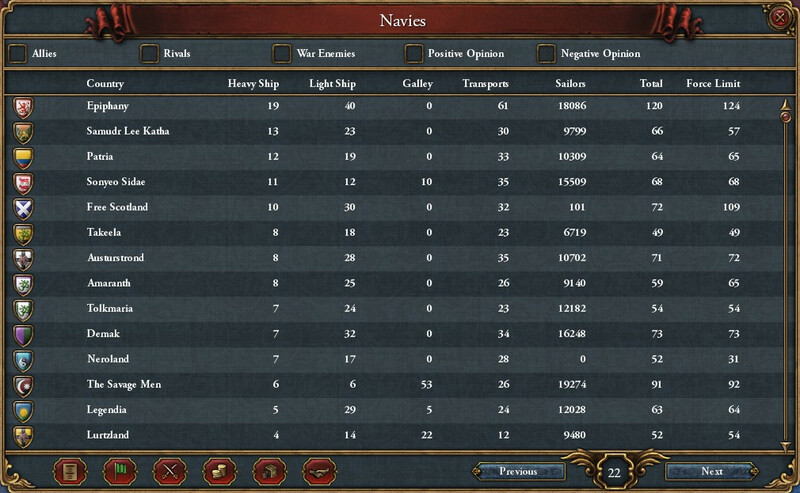 Tolkmaria as an ally is a useful counterbalance, especially if a route can be cut through the remains of Kabus. 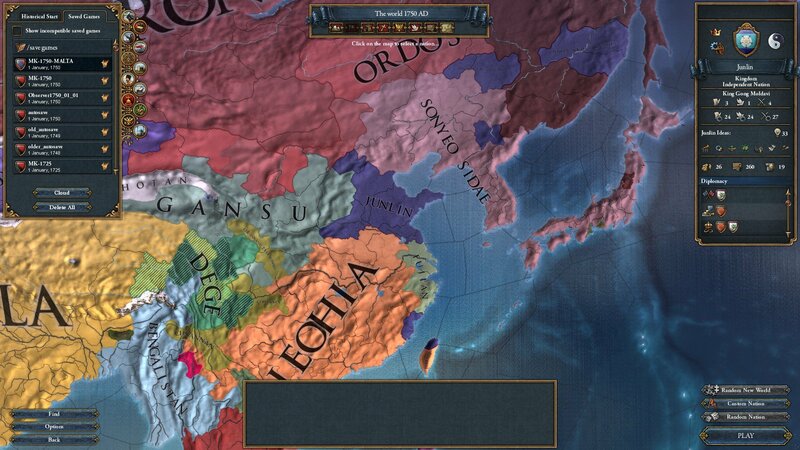 Having finally expanded into China instead of staying as Sonyeo's lapdog, Jeohia find themselves in a spot of both. They're going through the Aspiration for Liberty disaster, while at the same time at war with Takeela, which is a disaster of its own. Junlin have somewhat managed to arrest their slide, in that they've only lost once province in 50 years. 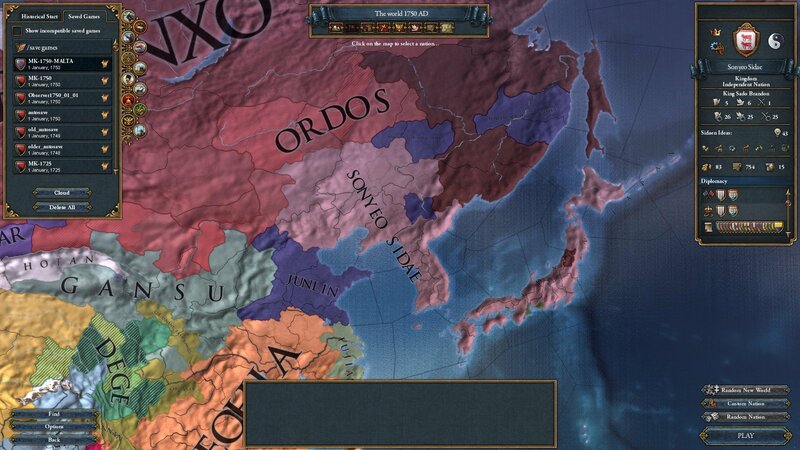 That one province though, was Beijing, their 32 development capital and centre of trade. Whoops. In any case, their one ally is Amaranth now, so Junlin are not long for this world. Kabus have not at all managed to arrest their slide. One of my favourite things about this campaign is just how precipitously sudden the Kabus fall was on the development graph. You not only have the drama of the most powerful country in the world collapsing, but it was to the detriment of a filler nation in lebubu's name, and to the benefit of The Savage Men and Tolkmaria who are both active followers of the campaign. tbh if it was scripted then Versailles wouldn't be dead and Erit Lux would be winning. It's all gone a bit pear-shaped. I think at this point we can say that Lahndahn backed the wrong horse. The Norse Bloc have always been a powerful enough force to theoretically protect Lahndahn from Epiphany, but effectively, it was a difficult enough relationship that when the Holy Roman Emperor finally set his sights on the English Channel, the Norse weren't going to risk it all just for a Protestant trader. Lahndahn are currently in their third defensive conflict. 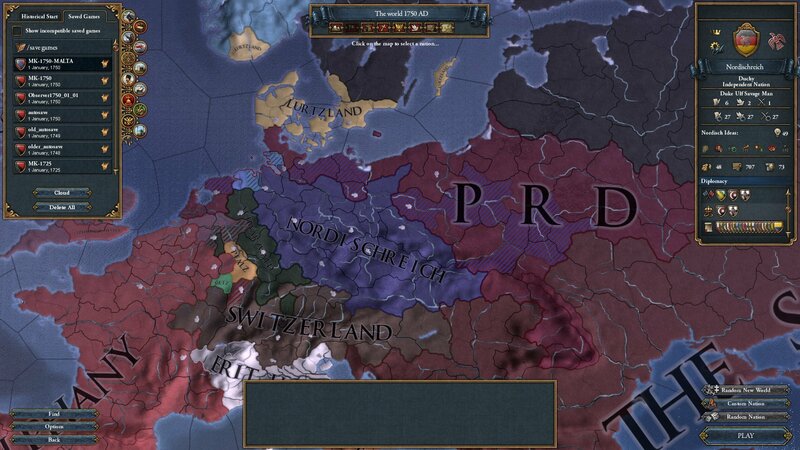 Their first was Epiphany and friends; their second was against PRD and Vikingar, who managed to take Holland and its surroundings; their third is against Schwarzwald, who are seizing their golden opportunity to not die instantly once Nordischreich and Switzerland come for them again. 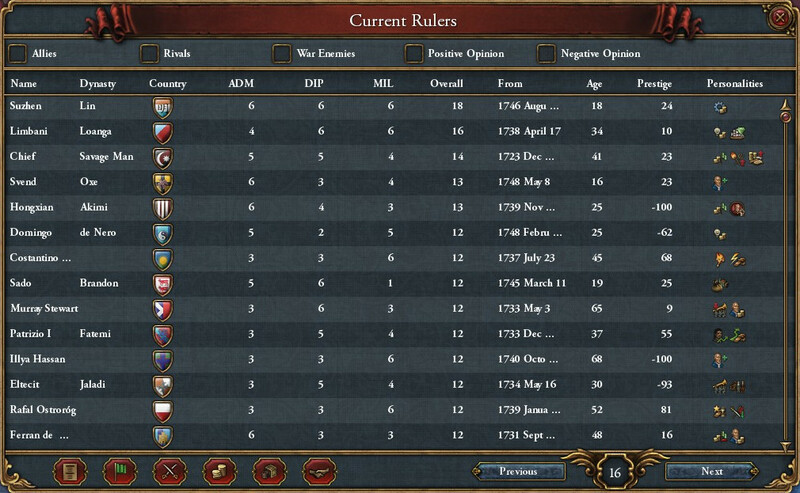 God, remember the early midgame? When Erit Lux were the richest, best connected country on Earth, and Legendia were somehow at war with The Savage Men and barely had allies, never mind enough to win a fight? And when I probably stated many times that it was a matter of time before Legendia got swallowed from the north and east? Now the Serene Republic has grown up into the dashing imperialists we never thought they could be and they're busy subjugating East Africa and exploiting the gold and ivory trades. Brings a tear to my eye. 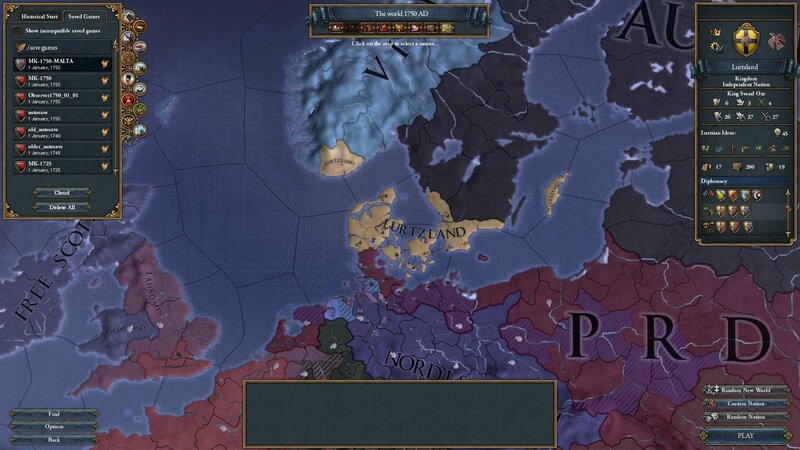 With their colonial ambitions well and truly dashed, Lurtzland are nevertheless managing to hold on. The PRD getting stomped is fantastic news for them. They're probably not going to get any land back, but it means that the Poles won't be marching into Copenhagen any time soon. 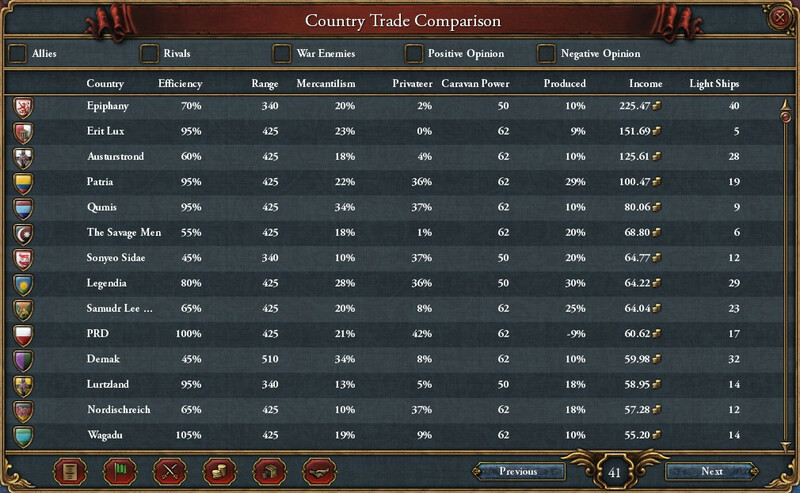 The stats may lie but the map doesn't. 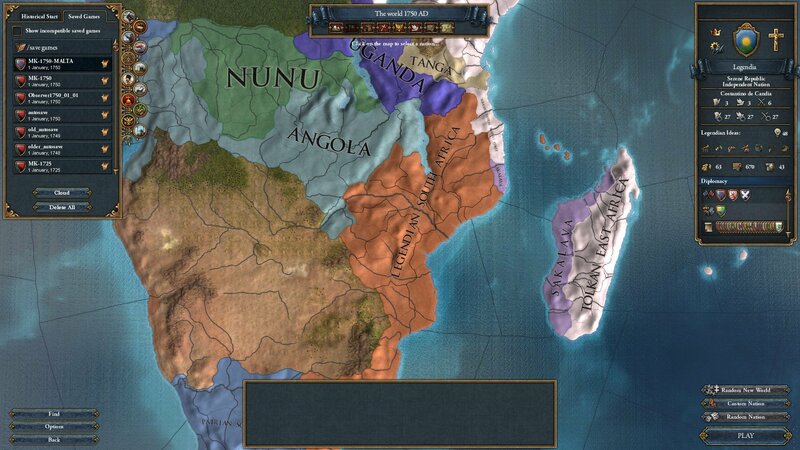 Neroland has taken a huge power hit as La Plata and Brazil declare their independence. 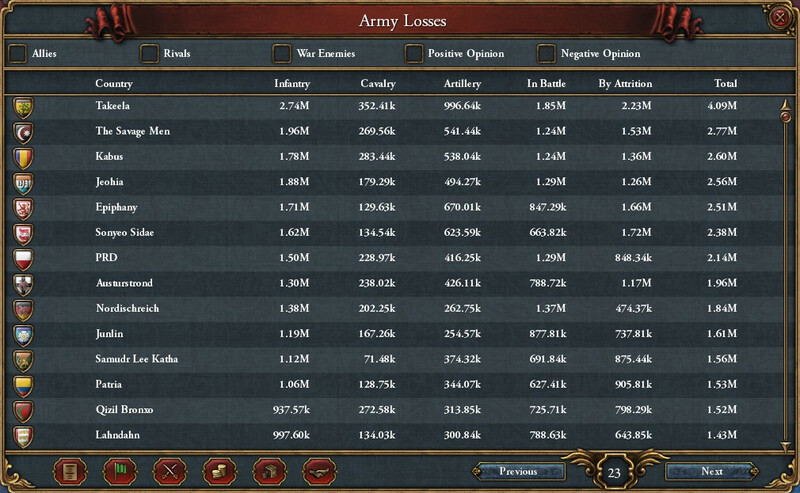 Neroland might still survive until the end of the campaign, if only they would stop jumping in to literally every single colonial subjugation on the losing side. Something had to be done about Ninjakorutsu's revival, and thankfully, Qizil Bronxo stepped up to the plate. They've lost all their allies and all their neighbours hate them and want their land. Bueno. To be fair to the German fascists, it was the PRD who initially betrayed Nordischreich, when the latter was facing down a coalition war. 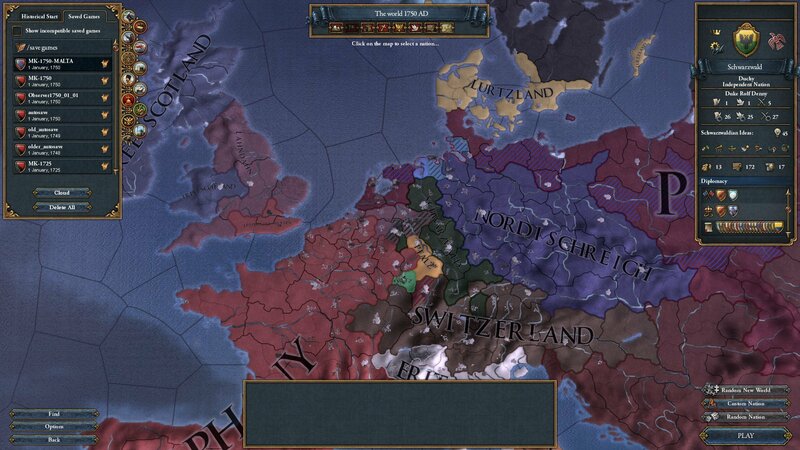 That Nordischreich won that war (thanks to Lahndahn, if we remember correctly) perhaps meant that a Nordischreich-PRD showdown was inevitable. In past writeups, I've investigated how that might happen, and the only feasible outcome was a betrayal from Austurstrond and The Savage Men. 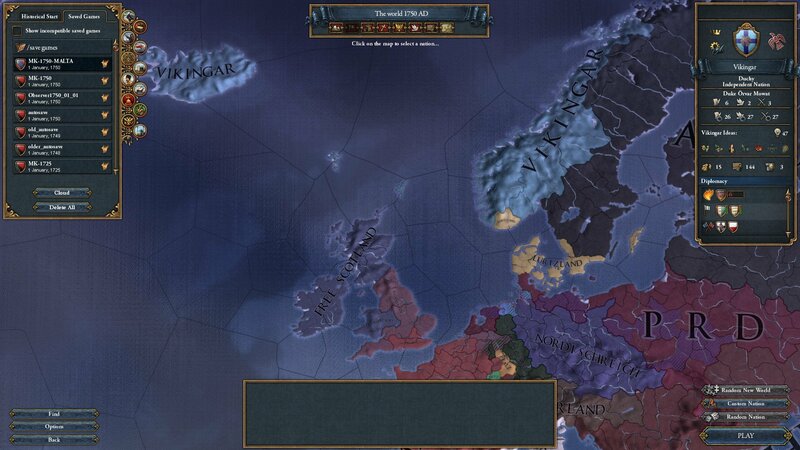 The Norse Bloc had become three autocracies ruled by the Savage Man dynasty and one democractic republic. It's not really a surprise that it's come down to this. 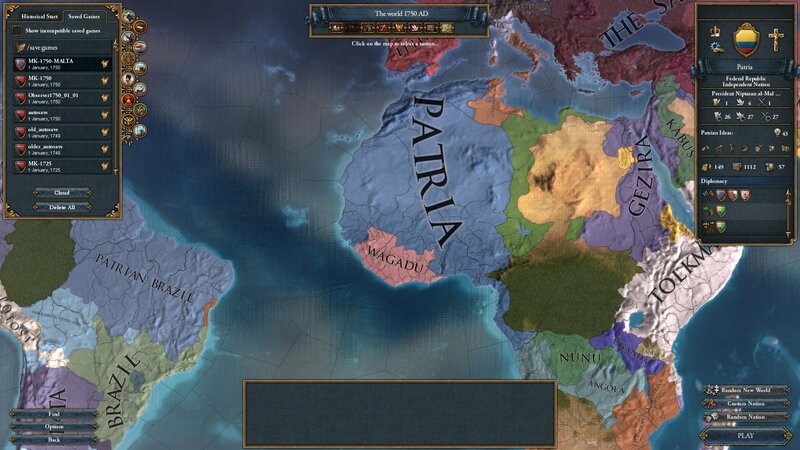 Patria are, albeit temporarily, up to #3 in the Great Power list. It's a testament to how well they've played this campaign from a position of weakness, starting in North Africa, surrounded by enemies. What's especially impressive is that they've somehow gone through Aspiration for Liberty and nobody even noticed because they just kept trucking right through it. Genuinely, I never even realised and I am at least slightly taken aback. Anyway, Patria have expanded enough that they're now the biggest trader in the Ivory Coast, and are directing all of that trade on to Sevilla. If they take out Wagadu - like their shaping up to do - then they'll have majority control. 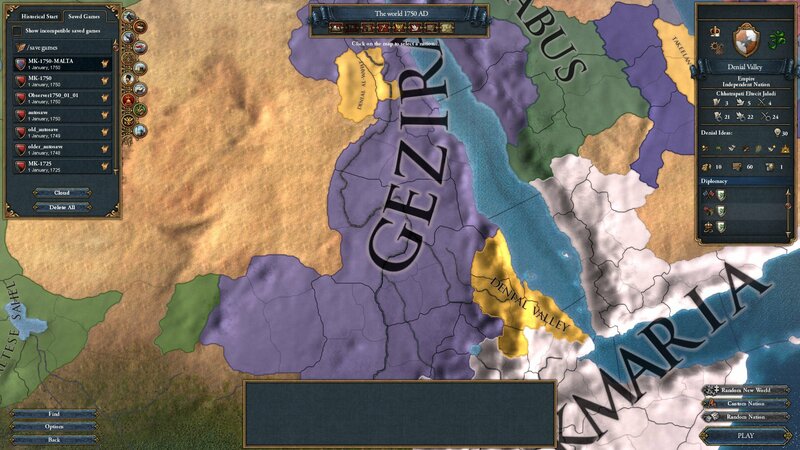 And a really cool looking name covering the entire west cost of Africa. Technically still alive are Pirineos, but it's one hell of a technicality. 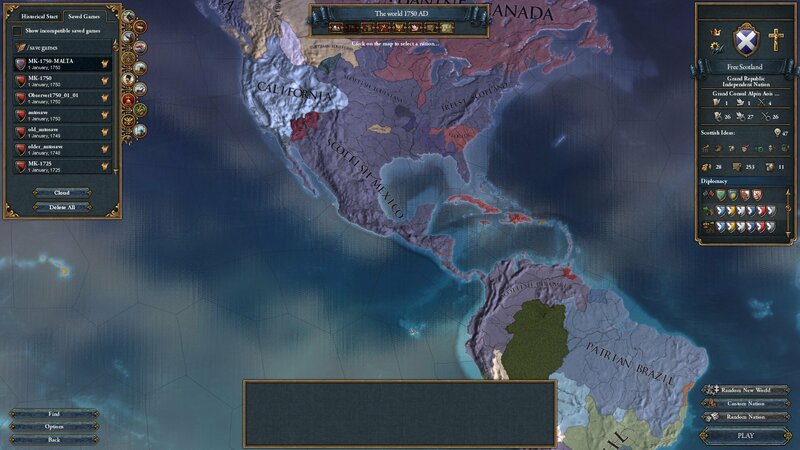 Can you imagine how it feels to know that your own colony could rise up and annex you at any time? Prince Felip de Nero doesn't need to. This is surely the end of the road for the PRD. 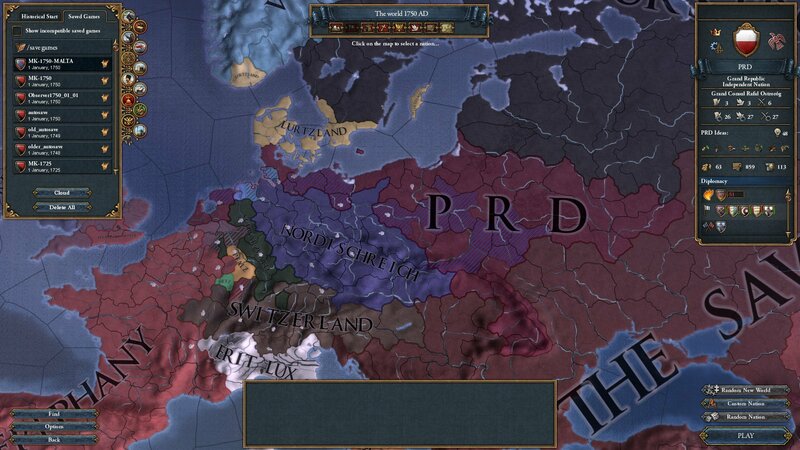 This initial war itself shouldn't be too damaging, because it's a war of Reconquest and the PRD only have one of Nordischreich's cores - Berlin - which means that any other provinces will be Unjustified Claims. It's the longer term that PRD have to worry about, as they've lost their two age old friends. 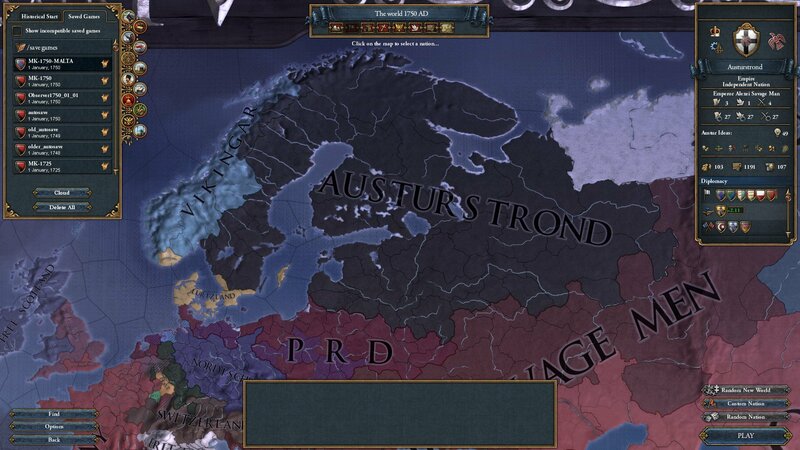 The Savage Men would be willing to ally right back up once the war ends, but Austurstrond are already eyeing up Polish lands, and their truce ends in mere months. Will they jump in before the PRD can resecure their alliances? 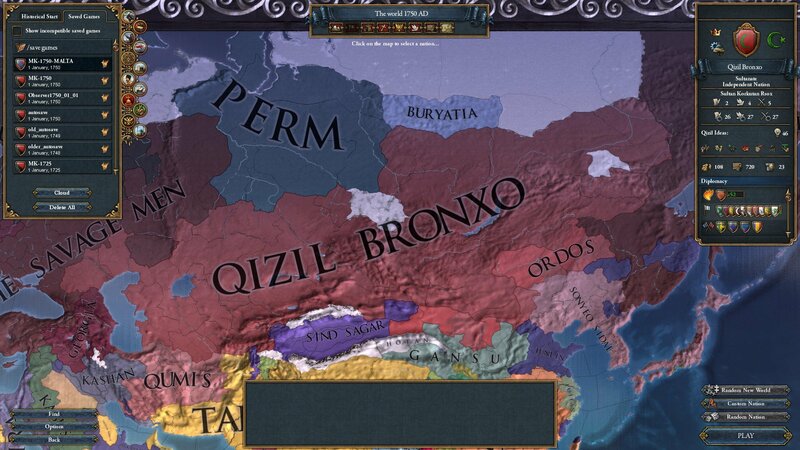 Luckily for Sultan Korkutan Rsox, The Savage Men didn't really want too much from Qizil Bronxo, this time. The Broncos have been left to their own devices to conquer their way to the Bering Strait. They might just do it too, the absolute madmen. Samudr Lee Katha suffered what can only be described as a humiliating defeat at the hands of Demak in defence of Amaranth. 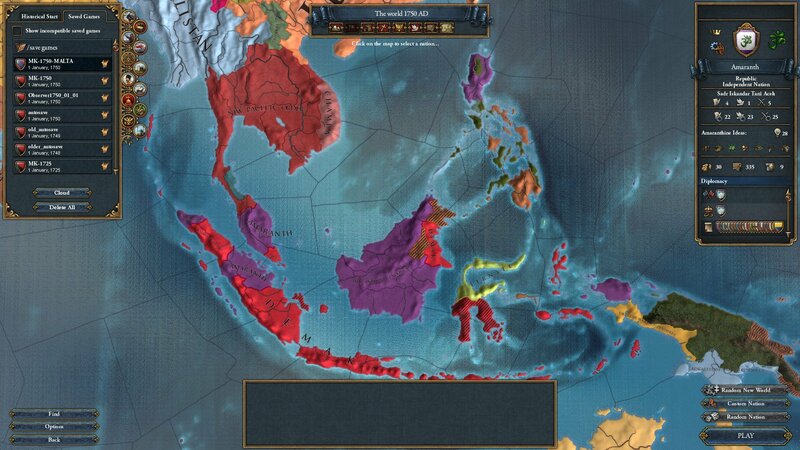 Their Malayan ambitions are finished for the time being, as Demak overtake them in income, army size and development. Their foreign failures have led to unrest at home, with Samudri Revolutionaries sitting in the capital. The Samudr armies are nearby, but they have to move fast, because it government will be overthrown in 20 months should nothing else change. It has been a funny old game for Schwarzwald. Just when Nordischreich and Switzerland close the vice, Lahndahn collapses and offers the Germans an outlet for expansion and survival. It's a Nationalist war, meaning Schwarzwald could very comfortably take the remains of Lahndahn's continental holdings as they're all Dutch (part of the Germanic culture group). A curiously static set of statistics for Takeela. Why? Because of our campaign's first successful revolution. The old Administrative Monarchy has been replaced with a Constitutional Republic, following a long and costly civil war. If Takeela weren't already in such an unassailable position then this would have been problematic, but all it's done in reality is slowed the Golden Scourge down. 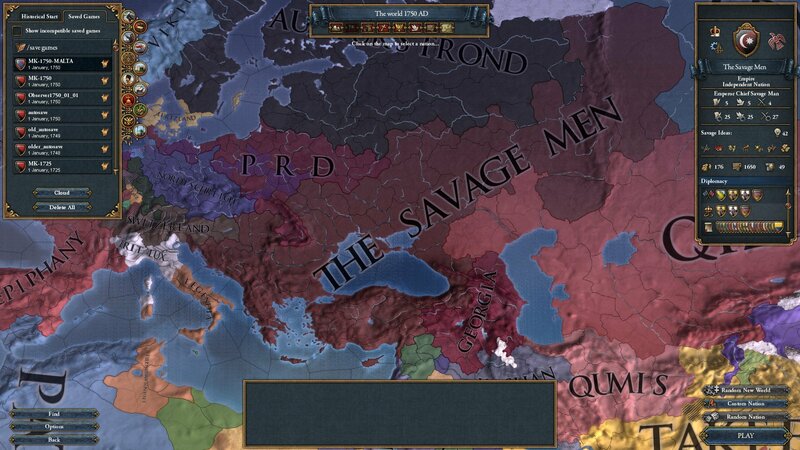 In all ways but score, The Savage Men are leading the world. A Savage Man is the Duke of the Nordisch, sits on the throne of the Kingdom of Austurstrond, and the Chief Savage Man himself rules the Empire from Constantinople. 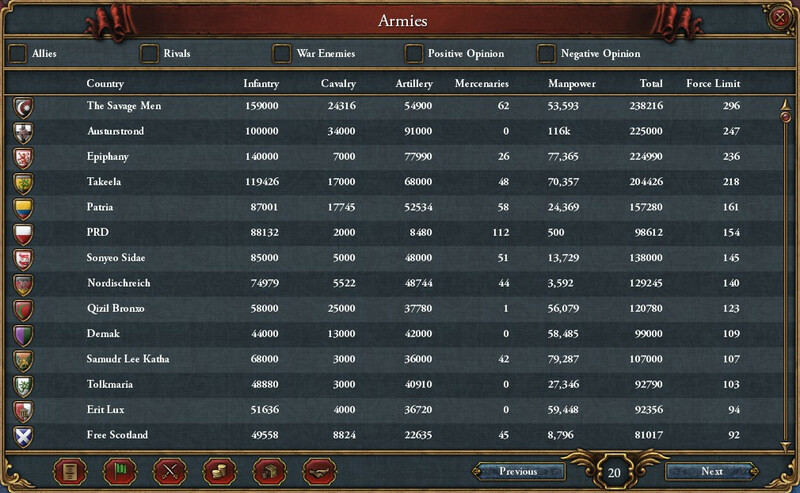 The Savage Men possess the most development and the largest army in the world, with a force limit of nearly 50 more than their nearest competitor. The only way for The Savage Men to win by score would be to actively stop Epiphany and Austurstrond from accumulating more. It's a testament to how powerful TSM are that they could potentially manage this, though it's incredibly unlikely to happen. 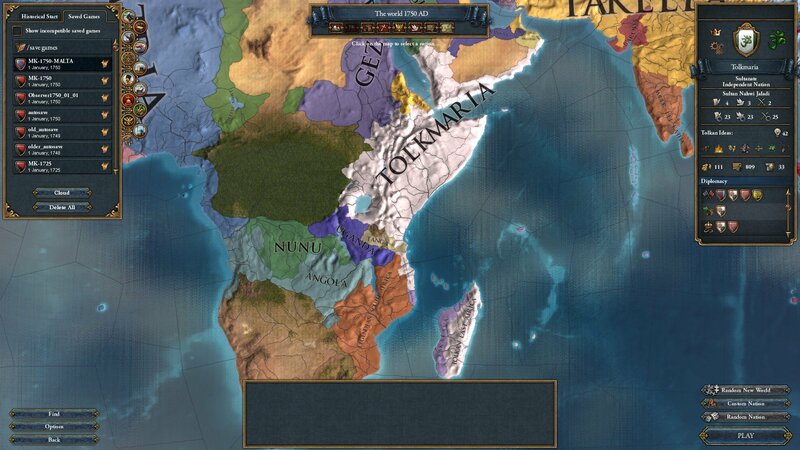 Tolkmaria are finally going ham on the remaining East Africans. 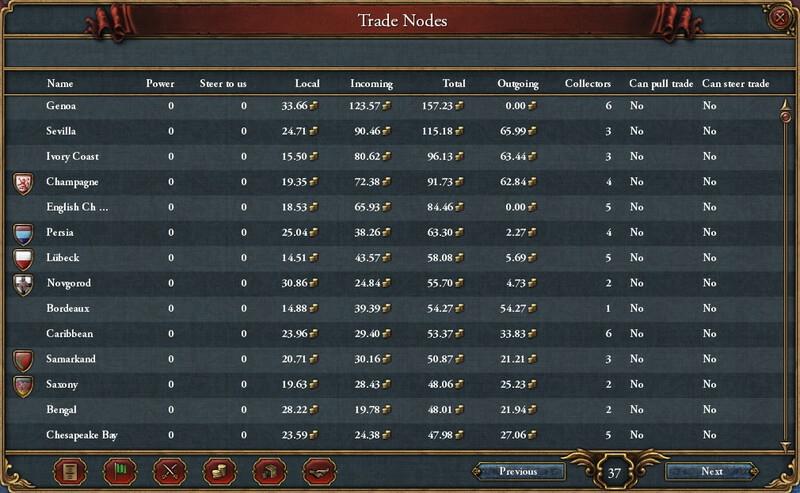 They've come to dominate the main trade nodes (though the AI is massively misplaying the trade situation), all the most developed provinces, and have stopped Legendia from advancing into their rightful homelands. While Legendia are a powerful, well connected country, Tolkmaria don't have much cause to fear a defensive war. Epiphany and Free Scotland would never be convinced to enter an East African land war, and Tolkmaria have Takeelan backup in any case. All that remains for Tolkmaria to do is to make sure they take more land than Legendia do. Vikingar have managed to wrangle an alliance offer out of Austurstrond, which is very handy, given that their other ally - the PRD - is dead and trying to drag Vikingar down with them.